It was the winter of 2008. I had just finished shooting a documentary that took two years to film, and I had to face the daunting task of sifting through six terabytes of footage. The Internet was a great source for avoiding what ultimately had to be done. As I was procrastinating, an email from a cinematographer friend from Manila caught my attention. It was titled "Best U.S. Embassy Visa Application Story I've Ever Heard." As a Filipino living in America, I was very familiar with these sometimes funny, but mostly sad stories of trying to get to the promise land. I read it and was in stitches. It was written by one of the immigration agents at the American Embassy in Manila, and it was about this guy Arnel Pineda, who said that the reason he was going to the U.S. was that he was invited by the band Journey to audition for lead vocals. "Journey? 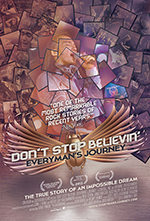 The rock band Journey?" Arnel nodded meekly, producing some flimsy emails and correspondence from the band. In a dubious voice, the agent asks Arnel to sing "Wheel In the Sky." Arnel belts it out loud enough for the entire waiting room to stop and listen to an amazing rendition of an old classic. "Look sir, there isn't a person in this Embassy who would believe that story-going to try out for Journey! So I tell you what, I'm giving you that visa. You're going to try out. And you're going to make it." The email ends with a link to the YouTube clip of Arnel singing "Faithfully." As I watched the clip, I got goose bumps. I Googled Arnel and discovered that he DID get the gig, and was now about to record and go on tour with Journey. I forwarded the email to my manager in Los Angeles, Peter McHugh, with a note saying someone should really make a documentary film about this. He emailed right back with "YOU should. I will track down their management." After tussling with Imelda Marcos (the former first lady of the Philippines, about whom I had made a film) in open court for sullying her "good name"-even though she had signed an airtight personal release-I swore I would never make a film about anyone famous again. And on top of that, Journey? The thought of music rights clearances was already making my head hurt. Little did I know that Peter was serious, and soon enough I was talking to John Baruck, the band's manager-and my filmmaker self could not stay away from a great story. After some back and forth, they decided that they were not ready for a documentary to be made about them. "Maybe next year," was the decision. I said, "Next year, there is no story. This year is the story. Let me film one day with the band rehearsing with Arnel. I'll put together a ten-minute sample, and if you decide there's no story, you'll never hear from me again." This was also my way of hedging my bets-what if this was a ten-minute film? Iconic rock band finds unknown on YouTube, period. What if Arnel was not really willing to be filmed? All my doubts were put aside when I was finally allowed to film for one day and met Arnel in person. I found him to be profoundly articulate about his inner life, and a genuinely nice person with an extraordinary personal history. Documentary gold. I cut a ten-minute sample for the band and sent it off. John Baruck got back to me immediately. I remember the phone call because I had just wrapped a day of shooting a commercial, and I was afraid to return his call and get a negative verdict. When I finally got the energy to call back, John said, "Okay, when can you get your crew out here?" Well, be careful what you pray for. I had no money to go out there and just follow the band on tour! Meanwhile, Capella Fahoome Brogden, an established producer based in Baltimore, got in touch after seeing the sample. I told her where I was with it and she said, "Let's just do it." I reminded her that these things cost money. She had a little put away and she was willing to gamble what she had to start the process. So with a lot of trepidation and a gigantic leap of faith-I had never made a film without funding in place-we crewed up and joined the band on tour. Journey had been touring for some thirty years by the time we joined them on the road. It is a well-oiled machine with very many moving parts. Imagine a big organization moving locations, personnel, equipment, even the cafeteria every other day or so - that's what touring with a big act is like. To insert ourselves into this scenario was not an easy task. Although the band's management agreed that my crew and I were going to be filming every aspect of the tour, little did we know how unprepared the company was for us. They were used to the networks parachuting in for a day or two to film short pieces for the morning talk shows, then leaving, out of their lives and never to be seen or heard from again. But filming day in and day for a feature length documentary? The road manager had to integrate us into a fragile ecosystem. And some days were tougher than others - like when Arnel was sick or the sound check didn't go as planned. There were so many things that could go awry. I remember filming Neal Schon in the dressing room right before a show and, as was usual, he was practicing on his guitar. After a few minutes, he looked up and said, "You're still here?" Uh, this was months into the filming. "Yes, Neal, we're still here. " And on our part, it was tough keeping up with this humungous moving caravan. Capella, myself and the crew, along with equipment and luggage, were crammed into a mini van - driving all night singing Journey songs to stay awake after having filmed the entire day - keeping up with big touring busses as they raced through the highway and byways to get to the next stop. Only to do it all over again the next day. What kept us going was a great story and Arnel remaining open and accessible throughout the summer. In some ways, we ended up being his companions on the road. For starters, I was the only other person who could speak Filipino and I believe Arnel found comfort in being able to lapse into his native tongue. If we had filmed him in subsequent years (he finished his fifth tour with the band this past summer) we would have ended up with a very different film. By the second year, he had a roadie, his wife, and a few friends traveling with him; the entire dynamic had changed forever. As a documentary filmmaker, one of the most exciting things about the process is not knowing how it's all going to turn out. Observing life as it unfolds through the prism of the camera's lens is a privilege. The fact that Arnel was - and remains -successful makes this a feel-good film. It's a quintessentially modern rags-to-riches story, one that could only have happened in this self-referential age of social media. And no matter how clichéd it seems, it really is a story of never giving up. Or, at the very least, surrounding yourself with friends who never stop believing in you. As Capella, Josh Green (Executive Producer) and I have travelled to film festivals the world over, it is apparent to us that audiences young and old feel a powerful kinship with Arnel. Over and over again, the hearty bursts of applause and standing ovations have overwhelmed us. Audiences truly like Arnel, they want him to succeed, they root from him because his success affirms that in this crazy world we live in, good things still happen to good people. He truly is everyman. I resist calling this a music documentary. It is a documentary that has, at its center, a profoundly charismatic figure with a great story to tell. And, yes, it also has great music. You will leave the theater humming.